Chatuchak is an area approx 12kms North of Siam Centre. 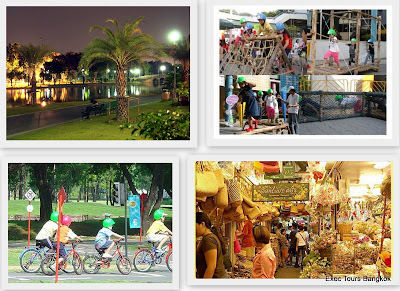 The Chatuchak area acquired it's name from the large public park of the same name. However, the area is best known for the largest market in Asia, the Chatuchak Weekend Market (also known as "JJ" markets). Land: major transport systems BTS (skytrain) and MRT (Subvway) access this area, as do public bus, taxi car, tuktuk or motor bike. The best known is the massive weekend markets, but nearby is Go-kart, a Fishing Park and more. Chatuchak is out of town although some of hotels have rooftop vantage points back across the city skyline, in particular Blue sky.